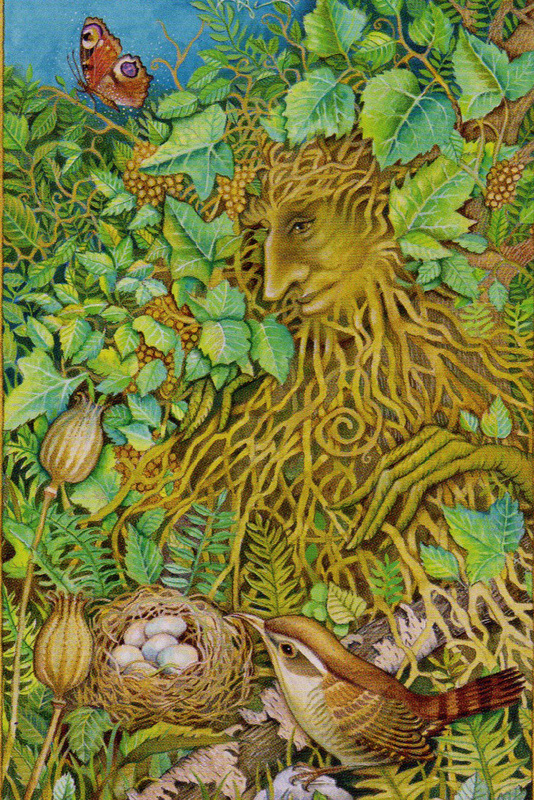 Green Man from The Chrysalis Tarot. Copyright Holly Sierra & US Games Inc 2014. 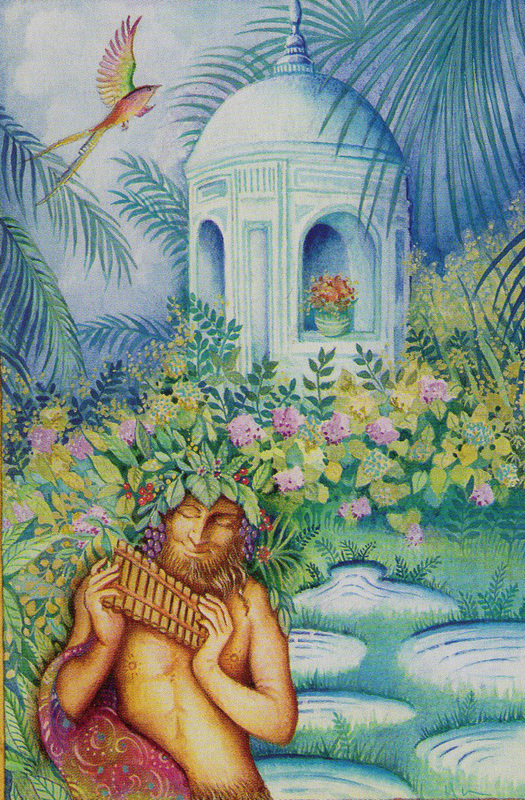 The week opens with Green Man, which is most commonly titled “The Emperor” in other Tarot decks. This card embodies the universal spiritual forces of Will, Control, and Organization. It represents skills at being organized, at knowing how to put a project together and get it off the ground, and it is usually a card of accomplishment since the Green Man gets things done. On the downside, the Green Man can be a bit controlling, sometimes even a control freak and the lesson of this card is to always remember it’s great to have a set goal in mind and a good idea of how to attain it, but you also have to be careful not to drive over anyone who may be in your way or may be too slow to join in. Patience may be required from time to time. 6 of Mirrors, The Chrysalis Tarot, copyright Holly Sierra & US Games Inc 2014.
either yearning for the past or perhaps wishing to see an old friend. The 6 of Mirrors can sometimes indicate a reunion with an old friend or a family member you haven’t seen in a long time. It’s typically a happy and peaceful card. The 6 of Mirrors (also known as the 6 of Cups in other Tarot decks) usually is a depiction of a garden. This is a card of slow and steady growth. So all that get up and go in the Green Man card will continue to evolve throughout the week. Things will grow at a pace that is appropriate for them and for you. An old friend may be of help. 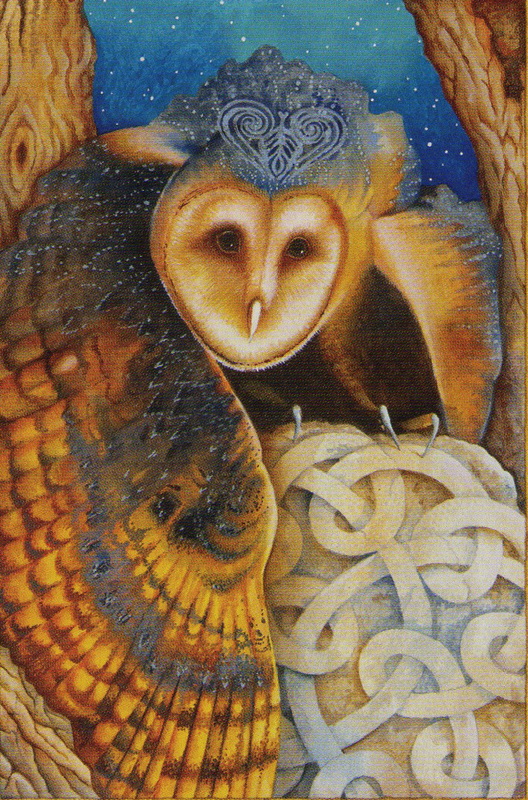 Celtic Owl, The Chrysalis Tarot, copyright Holly Sierra & US Games Inc, 2014. Green Man, is another card of the major arcana. In other Tarot decks this is known as the Hanged Man. The Celtic Owl embodies the universal spiritual forces of Self-Sacrifice, Illumination, and often can indicate feeling like you’re stuck in limbo or in a rut. At the start of the week you have all this great get-up-and-go energy around you that really gets things moving, but by the end of the week I think you’ll be ready for the weekend and wanting to rest and have time to reflect. The Celtic Owl can represent going within, meditating, finding the time to rest and relax. The upcoming weekend will come as a welcome break for many of us, but this will overall be a week of accomplishments. So go out & make it a great week!